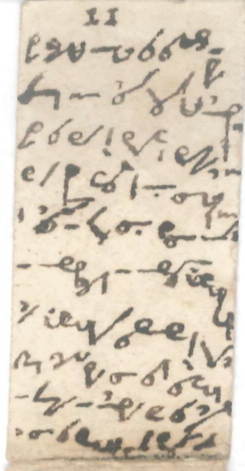 Who can decipher this encrypted note from Italy? 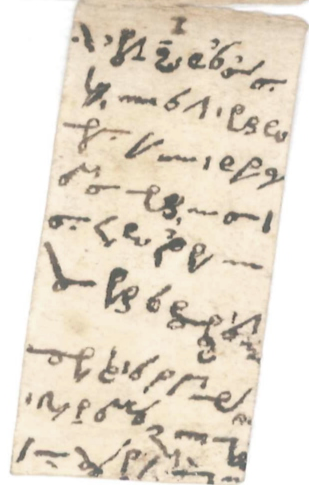 Italian crypto history expert Paolo Bonavoglia has forwarded me a 19th century shorthand note from Italy. Can a reader decipher it? 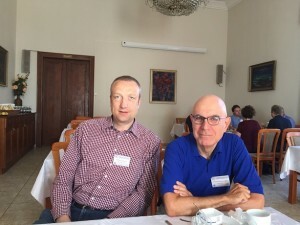 … a crypto history expert from Venice, Italy, and reader of this blog, has forwarded me an inquiry he received from a retired teacher from Alessandria (Piedmont). The inquiry is about a partially encrypted card from the 19th century. 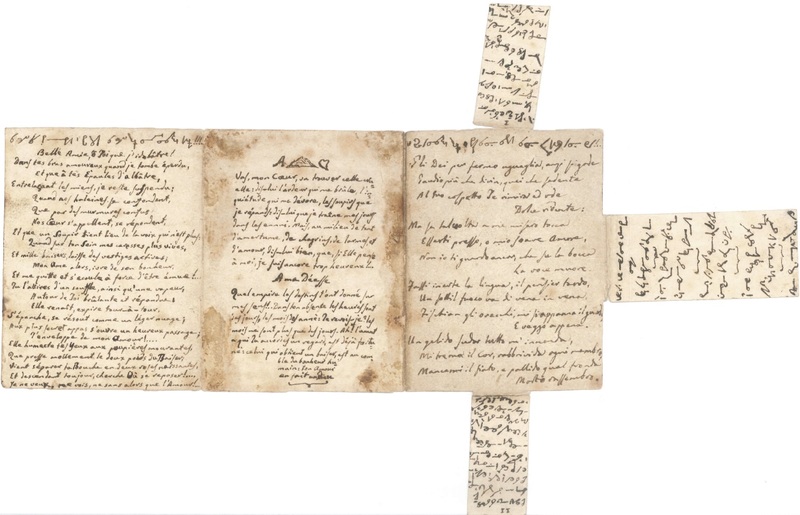 The cleartext consists of verses, half in French, half in Italian (here’s a transcription of the unencrypted part). In my view, the coding system used here is a shorthand. Shorthand played an important role in office work before the invention of recording and dictation machines. Shorthand was considered an essential part of secretarial training and police work, as well as being useful for journalists. Its main application was to to record oral dictation or discourse. A typical shorthand alphabet consists of simple symbols, which allows someone well-trained in the system to write as quickly as people speak. Already the Ancient Greeks probably knew shorthand. It was reinvented in England in the 16th century. Dozens, if not hundreds of different shorthand systems were developed and used. Among the most popular are Pitman, Gregg, Gabelsberger and Teeline. Many others were used by few people only and have long been forgotten. In addition to speed writing, shorthand has always been popular as a means for low-grade encryption. While a shorthand can be easily decoded by a trained person, it is often sufficient to keep a familiy member or a postman from reading a text. Today, when looking at an old shorthand text, it is not always clear, whether the author used shorthand for speed, secrecy or both. In any case, reading an old shorthand text can be a major challenge. As many different systems existed, some of which were quite uncommon, a lot of expertise may be necessary to identify a system and to read it. In some cases, the only way to decipher a shorthand is to apply codebreaking techniques. Can a user tell what kind of shorthand has been used here? And can you decode this cryptogram? Further reading: Who can decrypt this shorthand postcard from 1904? Why don’t we all learn shorthand in school? If it’s so much quicker, why hasn’t it become our main writing system? 99% it uses the Delpino Stenography system (1819), an Italian adaptation of the Taylor system (1786). The difficulty is that only consonants are written, vowels only, and not always, at the beginning or end of a word; and there other shortening tricks which makes deciphering hard and context dependent. So you find a “v n t” word which can be: “vinto” “venuto” “vanto” “vento” and many others! The game is not yet over. Good job Paolo Bonavoglia! I agree, it looks like “Delpino Stenography”, which derrived from Taylor’s system and I think it fits also the time frame. I read, that the “Delpino” was the best stenographical system at that time. First of all: iI t was the cousin of the owner of the note to advance the Delpino hypothesis. 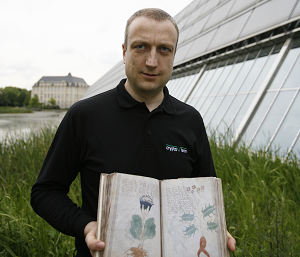 Now I can conclude the enigma is solved, but it is quite difficult to recover the original text. The enigma is solved: we know it is a Delpino shorthand system. I read a bit of Delpino book, two remarks: 1) shorthand is ambiguous; it uses mostly consonants, rarely vowels; the original text can be safely recovered only knowing something about the content; so deciphering is context dependent; 2) shorthand is also short-lived, a text so written in parliament or in a court, is immediately after transcribed into a clear text, easy because the content is still well remembered. Number 1 is tolerable because of number 2. Years after it may become very difficult to recover the clear text, out of the context. So it is for this note, I tried to decipher the encrypted text, having the Delpino table at hand; not so easy at all; just an example; the top left line, deciphered is “L GRN DL PI S PRT P. VLT L GRN VNT M R S M M T CNT TRNTR !!!”. In Italian it may be interpreted in so many meaningful ways. “IL GRANO DEL PIÙ SEPARATO …”, or “IL GIORNO DEL PIO SPIRITO …”, “IL GIRONE DELLA PIA ESPERTA …”. The next is easier “IL GRAN VENTO AMOROSO”, or there is something else matching? You may just look for a plausible deciphering, but out of the context of two centuries ago, what does “plausible” mean? You must study and get used to that context. Maybe somebody here has a better eye for this? ?